EPISODE 6 What Factors are Limiting my Weight Loss? 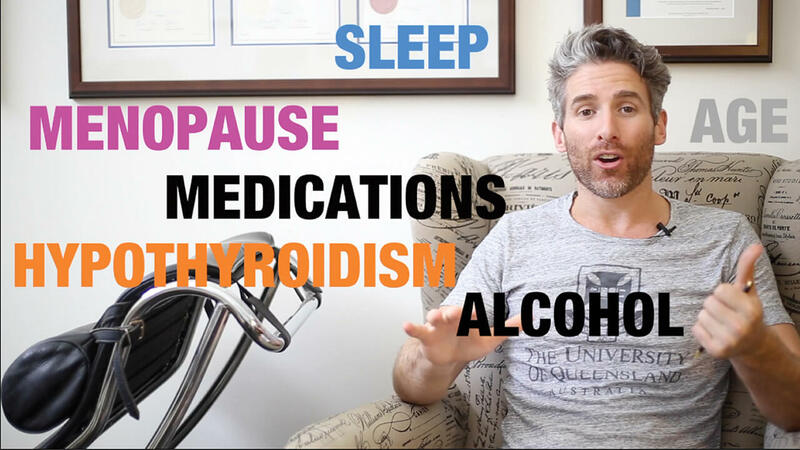 In this Thursday Therapy episode, Glenn Mackintosh talks through menopause, hypothyroidism, age, alcohol, medications and sleep, and why worrying about their effect on your weight is not worth your energy. Thanks for your question, Leslie. I’m going to answer but before I do, I want us to take a step back and I want to talk about the type of questions that we ask. As a psychologist, I’m trying to help people ask powerful questions which will deliver powerful answers, so, to give you a quick example of that, I’m quite a solution focused therapist, meaning that I’m probably more interested in finding solutions to the problem rather than spending a lot of time diagnosing the problem. So, while I acknowledge that it is important to spend some time asking “Why?” If I’m in session with someone and there’s a lot of why questions; why am I overweight? Why don’t I have a good body image? Why don’t I like exercise? We spend too much time asking those questions and we get bogged down in the problem. So, what I encourage people to do, is shift the emphasis and ask “How” questions; How do I change? How do I learn how to eat in a better way? How do I learn to enjoy moving my body? For me the “How” question is a much more powerful question. We’re going to get a lot more out of our therapy. So, I’m going to answer your questions but I want you to think about, in the future, asking more powerful questions. The first question is about menopause. Well, I wouldn’t encourage you to spend too much time on the menopause question because I can’t encourage you to not go through menopause because the menopause is going to affect your weight. Because it’s something that we can’t control, I’d encourage you to spend your time and your energy focusing on different questions. The other was the hypothyroidism and weight loss. So, again hyperthyroidism can affect your weight but hyperthyroidism is not just a weight issue, it’s something that affects your health, it affects your energy levels, it affects your mood, it affects a whole variety of things. So, in the future rather than asking, “Does this thing help me lose weight or does it hinder my weight loss?” I want you to ask, “Would working on this be good for me as an overall person?” One of the traps that we fall into is we assume that weight loss is the gatekeeper for our health and our well-being and our success, and then if we don’t get the weight loss that we expected, we abandon these really good healthy habits because they don’t give us weight loss. So, I don’t want you to take care of hyperthyroidism for example, because it’s going to help you lose weight. I want you to do it because it’s a great thing for you to do and then as a result of that, if you lose weight, absolute bonus, fantastic. Again, we don’t want to assume that weight loss is the guardian of your health. If you were drinking a lot of alcohol and you reduced that alcohol, great work, it’s going to be great for you to reduce that alcohol for your mood, for your physical health, for your sleep, for your energy levels, for your attention, your concentration, your decision-making and a whole range of reasons. So, let’s try and zoom out from just the weight loss and focus on taking care of yourself, just because it’s a great thing to do, then you can get those health benefits directly rather than working through weight loss. Let’s move on and I’m going to give you another couple of questions that I commonly hear from people about a couple of other factors that affect your weight. The first is medications, “Do medications affect my weight?” Well, medications can affect your weight but again, I’m not going to encourage you to take yourself off a medication that’s good for you in order to lose weight. For a lot of us we end up inadvertently doing things that are unhealthy for us to lose weight because losing weight will make us healthier. So, doing things that are unhealthy in order to make us healthier is a false economy. So, I’d encourage you to think about if there’s anything like that in your life and let’s make sure that we’re not doing things to lose weight that are inadvertently unhealthy for us. The second thing is sleep. People often ask me if sleep affects weight and the answer is, yes, sleep does affect weight, but we’ll put up a graph of the zillion factors that can affect your weight. There are so many factors that we can’t say that just changing one factor is going to help you to lose a lot of weight. So, what I don’t want you to do is I don’t want you to do something, like, take control of your sleep and sleep better, so it’s going to make you lose weight because then if you don’t lose weight or if the weight loss isn’t as big you expected, you can end up abandoning a really good healthy lifestyle habit because it doesn’t help you lose weight. So, again let’s take the focus off the weight, assume that you’re not just a number on the scales and your success and your well-being and your happiness isn’t dependent on just being a particular number on the scales and if you want to get happier and healthier and more successful, you can focus on that stuff directly, rather than through the vehicle of weight loss and I think then you’re going to find yourself and asking more powerful questions and then you’re going to get much, much more powerful answers. So, I hope that answers your questions and I also hope that it encourages you to ask more powerful questions about how you take care of yourself. Thank you for paying attention to Thursday Therapy. Thanks for this session. Guys, you know what, I’m going to ask you a request before we finish on. Some of our favourite YouTubers, they get video questions and I’m jealous. I want a video question, so if you ask a powerful question and you ask it in video format, I’m going to be sure to answer it. So, please ask the questions and if you can ask a powerful question in a video format and I will answer it and then I want to encourage you to look at some of the questions, some of the factors that you’ve been thinking about how they affect your weight and even comment below on a question that you’ve realized was not your most powerful question. Let’s start to free ourselves of these questions and we do, we live in this dieting, weight centric industry that encouraged us encourages us to ask questions that are not so powerful. So, if you feel like this video would help some other people ask more powerful questions, please share it with them. If you like what we’re talking about, you want more please subscribe to Thursday Therapy. Thank you for your attention. I want you to just go through your week and ask great questions then you’re going to get great answers and I’ll see you in the next Thursday Therapy. Hey Buddy!, I found this information for you: "EPISODE 6 What Factors are Limiting my Weight Loss?". Here is the website link: https://www.weightmanagementpsychology.com.au/episode-6/. Thank you.